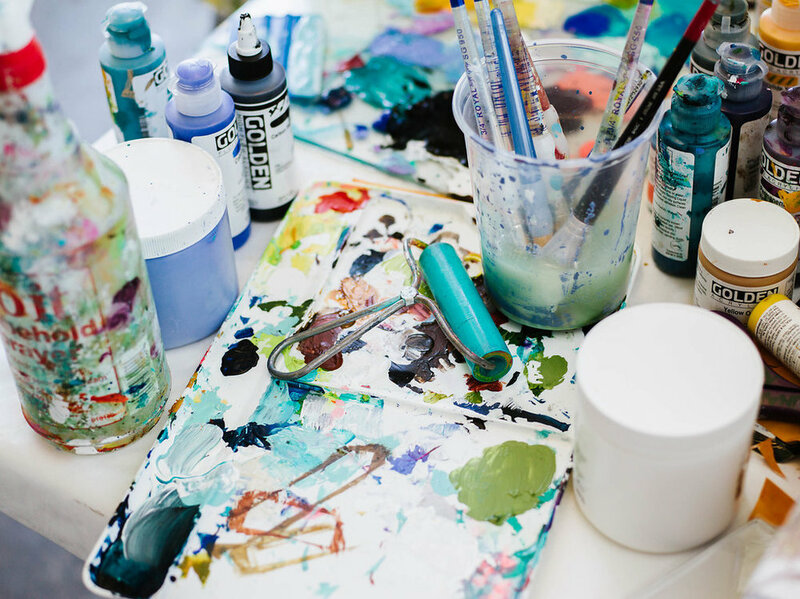 Recommended Art Business Resources — Annamieka: Artist. Let's Bring Your World to Life. How do I start an art business? Students ask me this all the time and I want to be clear: I’m not a business coach. I am a creative mentor and I will help you work on your art & creative practice. But I have compiled a list of favorite business resources. May they serve you in your learning! If you want to make money from your art, you need to learn business strategy. This is as personal a journey as figuring out how to make your own art, but I am happy to share what has been helpful to me in building my art business. Here are the business resources that I recommend. Art, Inc. by Lisa Congdon—Art, Inc. is like a very up-to-date map of what it’s like to build an art business using the power of the internet. It includes tips on running an online business and organizing images. While this book is geared towards painters and illustrators, I think all artists could benefit. Art Money & Success by Maria Brophy—Maria works as a rep for her artist husband, Drew Brophy. This book is like a frank and useful coaching session, and it’s very up to date (2018). Maria has unique marketing strategies that I hadn’t read about in other books, such as live painting at events and ways to attend conferences as an artist without having to pay. The Right-Brain Business Plan and Building Your Business the Right-Brain Way by Jennifer Lee—Jennifer’s first book, The Right-Brain Business Plan, is perfect for people who are just starting out and who need to create their business plan. It’s great for visual thinkers because it encourages you to collage, draw, and be guided by your vision. Building Your Business the Right-Brain Way takes it to the next level, showing how to create a sustainable business. One takeaway from this book for me was a mindset shift was about building a team around myself. I no longer think of myself as a solo entrepreneur who has to do everything: I think of myself as the hub of a wheel, and there are spokes going out to a team of other self-employed people who give me amazing support with different tasks. I will write about my dream team in a future Wonderletter! Wild Money by Luna Jaffe—Luna is an artist, psychotherapist, and Certified Financial Planner. Her book approaches money management from a creative perspective. It’s empowering to look at why you need money, what it’s for, and to take control of your planning. The Artist’s Way by Julia Cameron—This is a classic! Julia’s 12-week program teaches you to get in touch with and honor your inner voice and creativity through morning pages and by taking yourself on artist outings. I have kept up these practices for years! Art and Fear by David Bayles and Ted Orland—While this book may be a bit dated, it talks about what it means to be an artist in the world, which is timeless.. Steal Like an Artist and Show Your Work! by Austin Kleon—In Steal Like an Artist, Austin talks about how none of us have a truly original idea, but he talks about how to go about borrowing and mixing up ideas from others in a respectful way. Show Your Work! Is about showing the process of your work, similar to showing your work as you solve a math equation. How did you come to create that final piece? You’ll learn from this inquiry. Big Magic by Elizabeth Gilbert—by Elizabeth Gilbert—This inspiring book emphasizes taking responsibility for showing up for your creative work. Elizabeth Gilbert likens creativity to an entity that shows up and works through you. It doesn’t owe you anything: if you don’t show up for it, it’ll move on to someone else. It’s your responsibility to take care of it, not the other way around. The Crossroads of Should and Must by Elle Luna—I think everyone needs to read this amazing book! Elle distinguishes between all of the shoulds we put on ourselves and our one true calling, which is our MUST. It’s a beautifully illustrated book that carries you through the process of listening and stepping into your truth. These courses may or may not be around forever, but hopefully they’ll be here for you when you need them as a resource. Niamh Arthur’s Light it Up Video Marketing—Niamh has a free 30-day challenge that can teach you a lot, and her course is so useful. Her challenge is wonderful for getting you comfortable in front of the camera. Andrea Scher’s E-course Bootcamp. Andrea helped me nurture my first online course, Wild Wonder. I believe that business coaches should serve as a kind of librarian of resources and strategies. I think a good business coach is not going to tell you how to run your business - they are going to help you navigate the vast library of options and help you find the most helpful approach that's unique to you. The coach should really listen to you and help you listen to yourself so you can get clear on what you truly want so you know exactly what you want to do with this business and who you want to serve. Then the coach can help you create the steps to bring the business into reality: offerings, a revenue plan, a marketing plan, etc. I believe the coach doesn’t have the answers—you have the answers. Find a coach that holds space for you to find the answers for yourself. Avoid flashy promises of six figures and “I’ll give you these templates!” “We’ll sell your art for you!” Be very wary of messaging that promises anything quick. Because, truth is honey, it takes time. It takes time & work & devotion to build a business that suits you. Ultimately what will build your business is knowing who you are, knowing who you are serving, and knowing what you are and art not willing to do. To build a business you must nurture a connection with people that love your work and deepen the connection that you have with your work itself. Let those connections be the pillars that you build your business upon! I also believe that no single coach (or course, book, or any other resource) is the ONE resource that will make everything happen for you. Each resource will give you something you need, and then let go of the rest. The ones that resonate with you are shining a light on your true self; they’re holding up a mirror to give you access to your truth. The resources are there to help you actualize at your own pace, as you are ready. I feel that coaches are like therapists in that they have to be the right fit for the client. So while these coaches were helpful for me, I can’t guarantee that they will be the right coaches for you. Do your research and explore! Jennifer Lee, Artizen Coaching, author of The Right-Brain Business Plan and Building Your Business the Right-Brain Way. I’ve worked with Jennifer for the past 12 months and working with her has been transformational for me. She’s an artist herself and she holds a lot of quiet power. Tiffany Han:I’ve done several powerful group programs with Tiffany. I love her focus on values—she helps me to get clear on aligning the activities and actions of my life and business with my core values. Tiffany is a pro at coaching creative women on pitching themselves and their work and she inspires us to keep putting ourselves out there! & her podcast rocks. Mati Rose McDonough. She’s an amazing artist and a mentor of mine, and I hired her for mentoring in 2015 when I was really getting serious about my art business, and then traveled with her to Costa Rica in 2016 and 2017. It was amazing to work with someone who is walking the same path I saw myself heading down but has ten years more experience to offer. Our work together planted a lot of seeds that have now born fruit. I adore her! Like anything else, a course or book that lights me up may not do the same for you—but I hope it will. It’s all about timing. Trust the timing. You don’t have to read #allthebooks. You don’t have to sign up for online courses for all aspects of running a business. Don’t get too wrapped up in worrying about which platform, book, or coach is best for you. The real secret is to make a lot of work and share it with people. I hope this list is helpful for you. If you want to make money from your art, I highly recommend studying up on business. Building a business is very different from making art—it’s a different skill set, and it needs to be learned. If I were learning to play saxophone, I would play pretty roughly at first, and I’d need to find a teacher. This was true for me when I started my business, and I continue to find teachers and refine my skills. If you would like guidance in the art-making itself, I'd be happy to mentor you in that. In creative mentoring session with me, I will relate to you as an artist + as a creative person, and hold you to your creative power. I can help you develop your creative practice, make work that you love, and create a cohesive collection. As you can see, I do not choose to be a business coach but I would love to help you dive deeply into your art-making and creative process.